Just a quick reminder that I don’t dabble in Mongolian (party) politics, I just try to analyze political development, including parties and elections. In these analyses I try to stay as neutral and detached as I can. Given the size of the MPP majority, they clearly have the ability to carry to wide-ranging reforms if they decide to do so. But that ability also comes with a big responsibility for the country’s development. If Mongolians are not better off four years from now, lots of factors will have played a role, but the MPP government will be prominent among them. So, my rosy-tinted imagination makes me think that perhaps the MPP leadership or some parts of the party will take stock and recognize that the large majority they’ve won is a real opportunity to reform the party, reform politics and set Mongolia on a different path. As the MPP has taken over government positions, it has become clear how bad the state of public finance really is. The crushing debt that has resulted from the wasteful spending of the Chinggis Bond and thus the mortgaging of Mongolia’s financial future, leaves the new government very little manoeuvring room for new policies and initiatives. Yet, given the extent to which Mongolian politics is patronage politics where supporters expect to be compensated for their contributions with the spoils that go to the victors, it is very likely that many individuals and companies are knocking on the door of party chair and Ikh Khural chairman M Enkhbold to secure appointments. The recording of Enkhbold discussing the cost of particular posts that was leaked just before the election suggests that appointments potentially represent two “opportunities”: a) to reward supporters, and b) for sale. It should be noted that the MPP government is no different from previous DP or MP(R)P governments in this regard, yet, patronage is not a principle that is likely to yield good outcomes for the country and for Mongolians. Currently, from the outside, it seems like party leader M Enkhbold is very firmly in charge of the MPP and of the government. No alternative explanation has emerged for his decision to take the Ikh Khural chairmanship rather than becoming PM, other than his plan to run for president next year. In the meantime, no actions of the government so far suggest that Enkhbold is not pulling the strings in the background. Most of the appointments are identifiably close to him and from his “City” faction. Barring unforeseen developments, that would lead to the assumption that he would use his position as party chair to secure the candidacy for president next year. This has also been the pattern in previous presidents, i.e. they’ve kept a fairly close reign of the party even though they nominally relinquish their party position and even membership when they are nominated as a candidate for president. 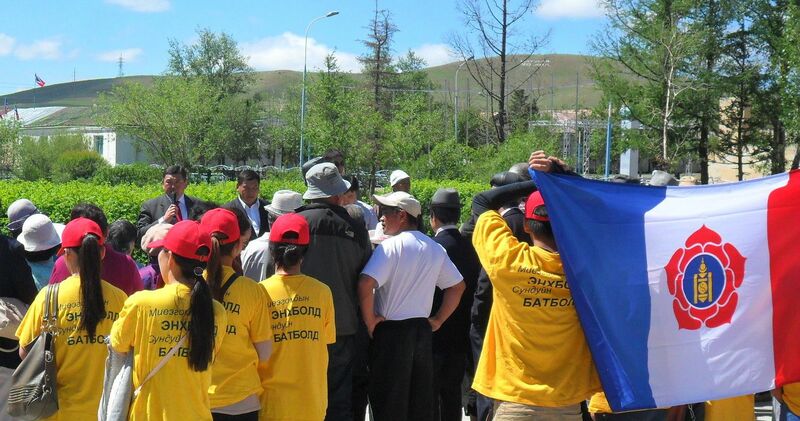 I attended a campaign rally in the final days of the 2012 campaign where Enkhbold spoke, then still a “regular” candidate from Tov. On the other hand, like Altankhuyag, he seems to manage his party well, or certainly his faction. He is thus politically skilled. There are no particular policy agendas that he has associated himself with or distinguished himself by. Substantively, it is thus very difficult to expect anything concrete from his leadership, and his likely presidency would be similarly unclear. Note the parallel with Altankhuyag in this regard. Is there a positive policy or political decision that you can recall from Altankhuyag’s primeministership? Enkhbold’s skills as a political operative raise some concerns over the extent to which he will be governing for the good of the people (especially in the more lofty role of president) as opposed to the good of his party or of himself. It’s obviously early to tell, but he has not given off any indications that he is reaching for bigger goals, though his government so far is limited by budget woes in what it might pursue. Note that in this discussion of party politics, I have not mentioned the role of a younger generation of MPP leaders. Isn’t it time that the 1970s and 1980s cohorts step up to leadership position so that the MPP can avoid some of the leadership paralysis the DP has been suffering from? This entry was posted in Corruption, Ikh Khural 2016, Inequality, Mongolian People's Party, Party Politics, Policy, Politics, Public Policy, Public Service, Younger Mongolians and tagged Julian Dierkes. Bookmark the permalink. I recognize that some of the hopes I tried to express in the post are naïve in that they will never actually occur. That’s why that imagined future is a bit rosy, i.e. overly hopeful.